Moles are extremely common, and almost everyone has a few. These formations are the result of high concentrations of pigment in the skin, with most moles appearing during childhood or adolescence. It is completely normal to have anywhere between 10 and 40 moles by the time you reach adulthood. These spots may change color over time — some may grow darker or lighter, while others disappear altogether. In the majority of cases, moles are harmless; however, it is important to remain aware of signs that could put you at risk for serious conditions. Because like moles, skin cancer is also very common. According to the American Cancer Society, skin cancer is the most prevalent cancer in the United States, and the amount of cases are increasing every year. Melanoma is a type of skin cancer that crops up when skin is exposed to an intense dose of the sun’s rays, also known as ultraviolet (UV) radiation. 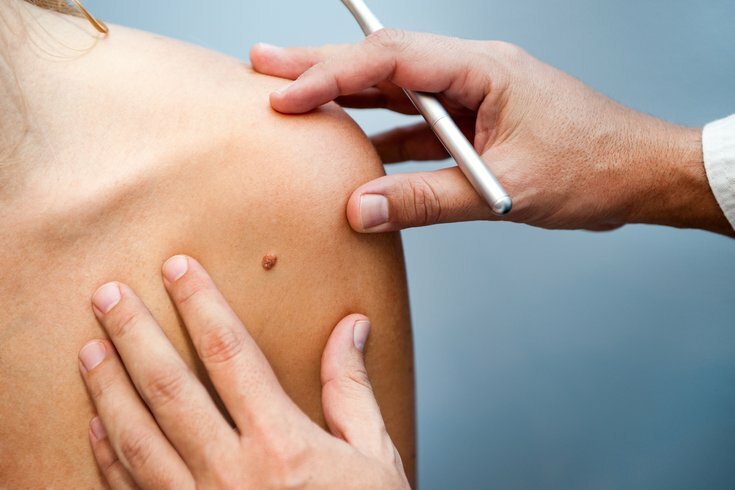 Melanomas can form on their own, or an existing mole can develop into a melanoma — in fact, moles that have been present from birth are more likely to become cancerous than those that appear later in life. Melanoma is a very serious type of cancer, but if caught early on, it can be successfully treated and removed before the affected cells have a chance to spread to other tissues or organs. The first step in determining whether your moles pose any risk to your health is to know how to identify the early warning signs that may point to potential problems down the line. Luckily, there is a simple way to check your moles using the easy-to-remember ABCDE method. Asymmetry (“A”) is the first thing to check for. If the mole is abnormal in shape, or one side doesn’t match the other, this qualifies as asymmetry and is a potential warning sign for melanoma. The “B” stands for borders — a benign or non-cancerous spot will have smooth edges. Uneven or “notched” edges could spell trouble, so keep an eye on any spot that has an unusual shape or border. “C” is all about color, and this can be a tricky one. Moles often vary in hue, from black and brown to shades as light as tan. When a single mole contains several colors, however, it may be cause for concern. Size also matters when it comes to moles, specifically diameter. If a mole is larger than the average pencil eraser, it may be time to get it checked out by a dermatologist. That brings us to “E,” which stands for “evolving.” Moles that change in shape, color, size, or elevation should be carefully monitored. Furthermore, if any symptoms like bleeding, itching or irritation occur, it is time to seek medical attention. New or unusual symptoms may signal melanoma or other types of skin cancer, so the sooner you consult your physician, the better. While moles themselves cannot be prevented, sun damage can. Wearing a sunscreen that protects against both UVA and UVB rays with an SPF of at least 30 is the way to go — opting for a hat and sunglasses for further protection isn’t a bad idea either. Taking preventative steps to shield your skin from sun damage, and routinely checking moles for changes or warning signs will help you determine whether that mole really is a cause for concern.